I don't know why right now I like cute stuff. Before, I like something detail with perfect shadow and effect. I feel like changing into another style. I like simple image right now. The difficult is almost nothing. The secret is, I do sketch in a paper for the first. And then I capture it using my camera cell phone. And then transfer it into my laptop and doing redraw and coloring. So, the key is you have to be able to draw manually in a white paper. That's can be the biggest help for you who wanna create some character. 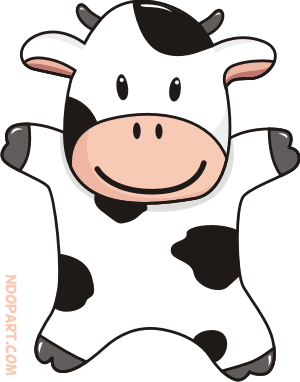 If you wanna learn what I've done, you can download the master vector cute cow for your collection. Can be opened using corel draw 11.